So there’s some teen singer named Justin Bieber. 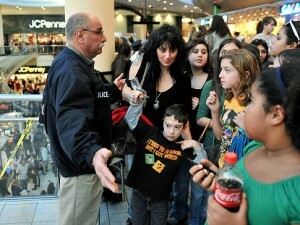 There was a bazillion young girls outside a Long Island mall. They all wanted a piece of the J-Man. Problem? The police decided the frenzied mob was too wound up, thought better of just breakin’ out a firehose, so they asked a label exec to Tweet an alert telling the crowd to disperse. Exec said no, exec gets busted. J-Man tried in vain to get the word out, but too late. Maybe J-Man is feeling the heat, as he booked it for London. Money quote from one of the throng: “I was more worried about not getting in than being trampled,” said Stephanie Fiorello, 13.